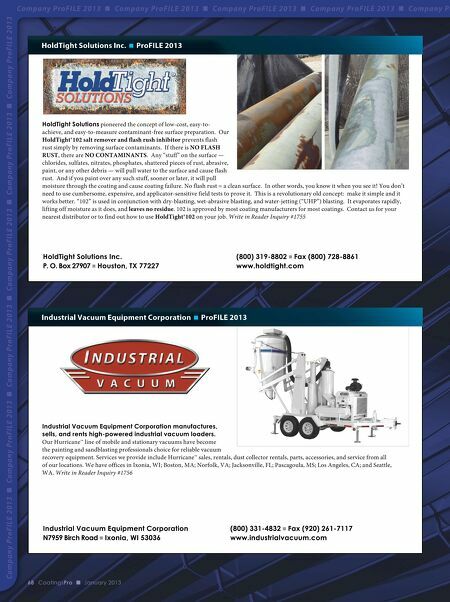 roFILE 2013 g Company ProFILE 2013 g Company ProFILE 2013 g Company ProFILE 2013 g Company ProFILE 2013 Company ProFILE 2013 g Key Resin Company offers the industry experience and product quality to meet the demands of your specific polymer flooring and coating needs. Since 1993, we've been providing a wide range of durable, applicator-friendly solutions for unique applications throughout the world. Key Resin Company develops flooring and coating solutions based on a variety of specifications such as chemical resistance, impact & wear resistance, thermal shock resistance, ESD/conductivity, slip-resistance, moisture vapor tolerance, and appearance. Key Resin Company 4050 Clough Woods Dr. g Batavia, OH 45103 (888) 943-4532 www.keyresin.com Company ProFILE 2013 To learn more about Key Resin Company and our extensive line of product solutions, visit us at World of Concrete Booth S11554, or visit www. keyresin.com or telephone (888) 943-4532. Write in Reader Inquiry #1757 g NEW PRODUCTS for 2013: KEY DIAMOND CHIP, a water-based moisture vapor tolerant decorative topping with various high-performance sealer options. KEY URECON 16, a durable urethane cement slurry topping formulated for greater coverage rate and lower overall cost. KEY "ALWAYS GREEN" SYSTEMS, for projects requiring USGBC LEED certification. Other new products include KEY PIGMENT PACKS, SPARKLE PACKS, KEY 730 EPOXY CARTRIDGES (Single/Dual Cartridges), and expanded product offerings throughout the various categories of Key Resin Systems. 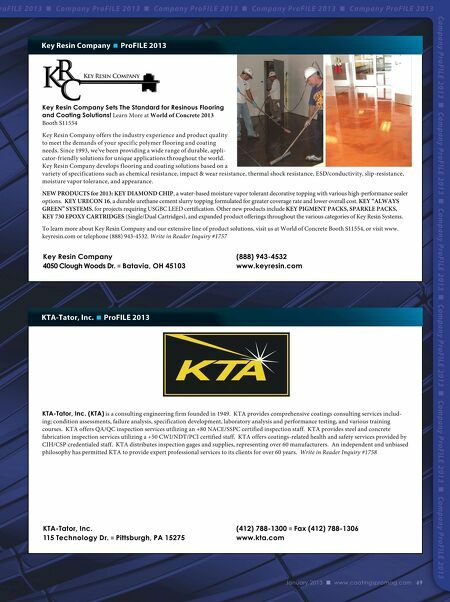 Company ProFILE 2013 Key Resin Company Sets The Standard for Resinous Flooring and Coating Solutions! Learn More at World of Concrete 2013 Booth S11554 g Company ProFILE 2013 g Company ProFILE 2013 KTA-Tator, Inc. (KTA) is a consulting engineering firm founded in 1949. KTA provides comprehensive coatings consulting services including; condition assessments, failure analysis, specification development, laboratory analysis and performance testing, and various training courses. KTA offers QA/QC inspection services utilizing an +80 NACE/SSPC certified inspection staff. KTA provides steel and concrete fabrication inspection services utilizing a +50 CWI/NDT/PCI certified staff. KTA offers coatings-related health and safety services provided by CIH/CSP credentialed staff. KTA distributes inspection gages and supplies, representing over 60 manufacturers. An independent and unbiased philosophy has permitted KTA to provide expert professional services to its clients for over 60 years. Write in Reader Inquiry #1758 g g Pittsburgh, PA 15275 (412) 788-1300 www.kta.com g Fax (412) 788-1306 January 2013 g www.coatingspromag.com 69 Company ProFILE 2013 KTA-Tator, Inc. 115 Technology Dr.